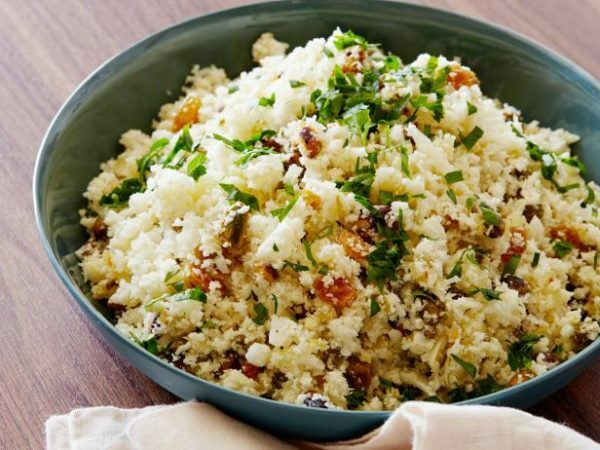 Cauliflower rice is a great low-calorie dish to have in your arsenal especially if you are eating low-carb. Super low in carbs, yet such a satisfying dish you will forget it's made from a vegetable and not a grain. There are two reasons I opted for roasted riced cauliflower in place of sauteed: 1) more flavor and 2) better texture. Preheat oven to 450 degrees F (230 degrees C). Line 3 baking sheets with aluminum foil and lightly spray with cooking spray. Fill a food processor 1/4 of the way with cauliflower pieces. Pulse 8 to 12 times until cauliflower is the size of rice grains. Transfer to a large bowl. Repeat with remaining cauliflower pieces. Drizzle avocado oil over cauliflower "rice"; toss until well-distributed. Spread 2 1/2 cups of the rice in an even layer on each lined baking sheet. Roast rice until golden, about 16 minutes. Remove from oven, stir well, and spread out again. Return to oven and roast for 6 minutes. Remove from oven, stir well, and spread out again. Continue roasting until browned, about 5 minutes more. Season each sheet of roasted rice with 1/4 teaspoon salt and place in a large container.